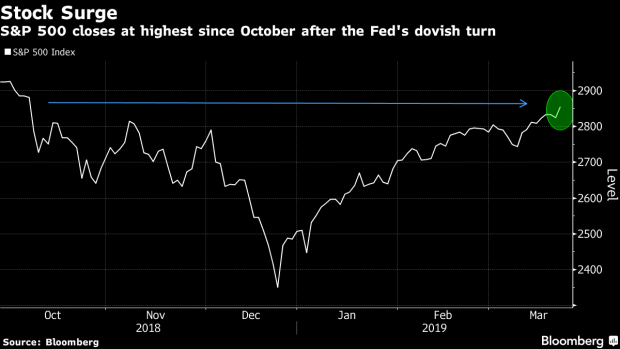 (Bloomberg) -- Asian stocks looked set to nudge up after U.S. equities reached a five-month high amid optimism for less-restrictive policy in the world’s largest economy. The dollar rebounded after a four-day decline, while government bonds stabilized. Futures on Japan’s Nikkei 225 rose 0.7 percent in Singapore. Hang Seng futures gained 0.1 percent. Futures on Australia’s S&P/ASX 200 Index climbed 0.7 percent. The S&P 500 Index gained 1.1 percent. The yen was at 110.81 per dollar. The offshore yuan held at 6.7070 per dollar. The Bloomberg Dollar Spot Index rose 0.4 percent Thursday. The euro bought $1.1379, little changed. The British pound added 0.1 percent to $1.3127. West Texas Intermediate crude fell 0.6 percent to $59.87 a barrel. Gold slipped 0.1 percent to $1,308.30 an ounce. --With assistance from Reade Pickert and Andrew Dunn.